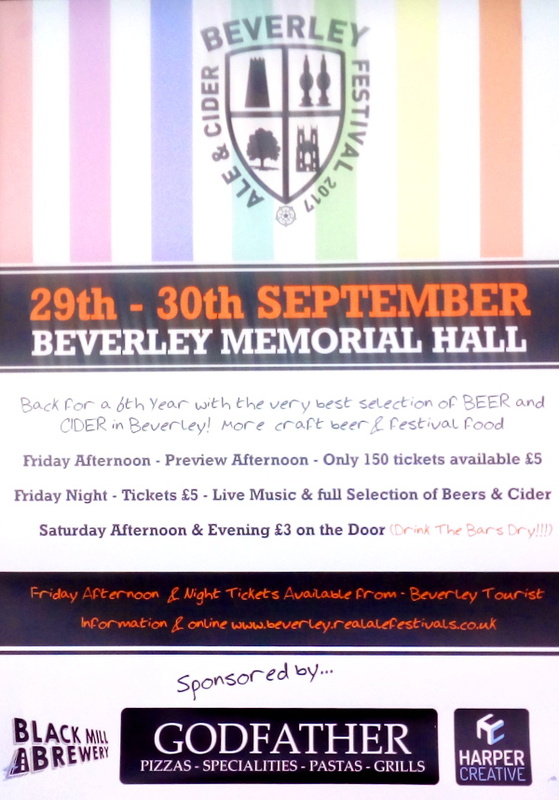 Back for a 6th year at this amazing venue, best selection of Ales Beers & Ciders plus festival food. £5 entrance on the door includes a festival glass. You get in free if you bring your ticket for the Friday Evening session. This session closes at 6pm. Camra Members get 2 free beer tokens on full paying entry for this session. Card must be produced. We have no bands playing on this session so conversations will take center stage!! We have invited breweries and publicans to join us for a industry meet the brewery afternoon. It is a pay on the door session with only 150 entries available so it wont get too over crowded. Enjoy fine craft beer and cider. The Friday evening session is a ticketed sessions 6.30pm - 11pm and guaranteed access. Advanced tickets are priced at £5 plus 35p online admin fee. This ticket includes a festival souvenir glass. On the door tickets will be £7 BUY TICKETS HERE or Tourist Information on Toll Gavel. 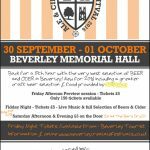 The Beverley Real Ale and Cider Festival has again been held at Beverley’s Historic Memorial Hall. 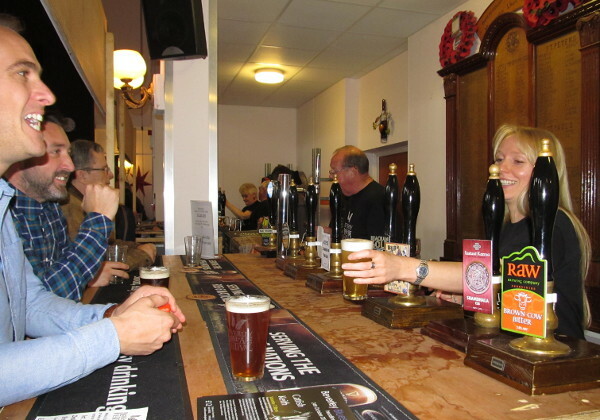 As in previous years there were plenty of tasty Beers, Real Ales, Lagers and Ciders, with food galore supplied by “Andrew Jones’ Pies” (a main sponsor of the festival for 2014 & 2015) plus there’s always a variety of entertainment. With Beers & Lagers from over 30 different Breweries, including Ryedale Brewery, Revolutions, Milestone, Chantry Brewery, Walls Brewery, Yorkshire Brewing Company, Jolly Sailor Brewery, Hambleton Ales, Great Heck, Wold Top, Scarborough Brewery, Great Newsome, Castle Combe, Double Top, Crystal Brewery and many more. 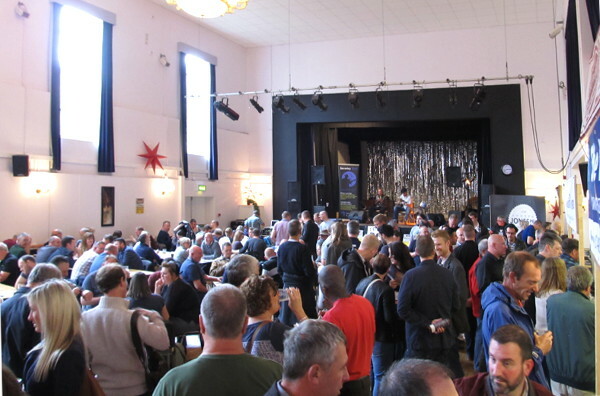 Another full house at the Beverley Real Ale Festival. 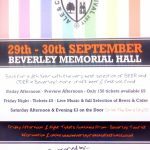 This annual event at Beverley’s Main Entertainment Venue is always well attended, has a fantastic range of ales & ciders, great pub food and on the stage an abundance of music. 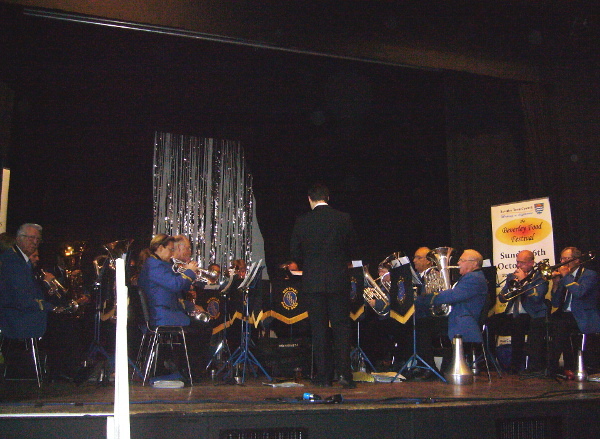 Over the years the beer & cider has been drunk to the background sounds of Brass Bands, Rock Groups, Folk Singers, Blues Musicians and even a Ukulele Band. Buy Tickets Online (cheaper) or at Door. 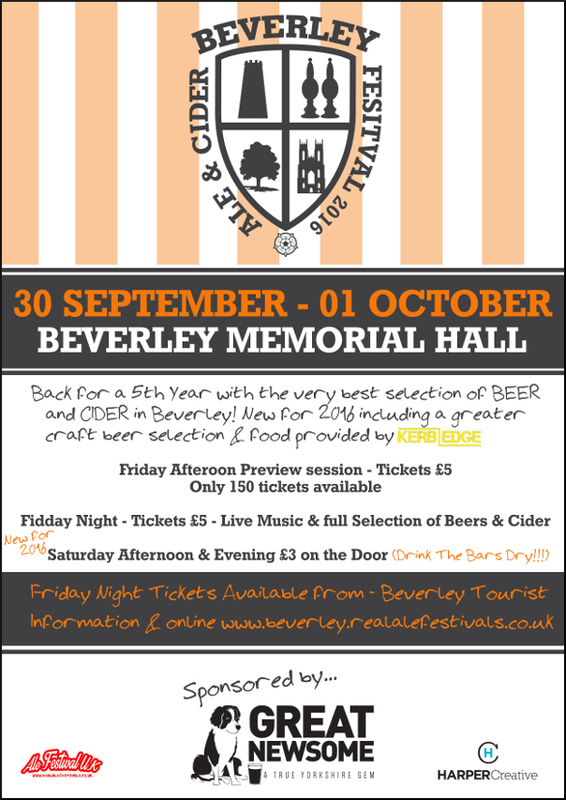 The Memorial Hall, Beverley is hosting the 2016 Beverley Real Ale Festival on 30th September & 1st October. Set within this fantastic building the festival will showcase some of the countries finest real ales and ciders, food and live entertainment. 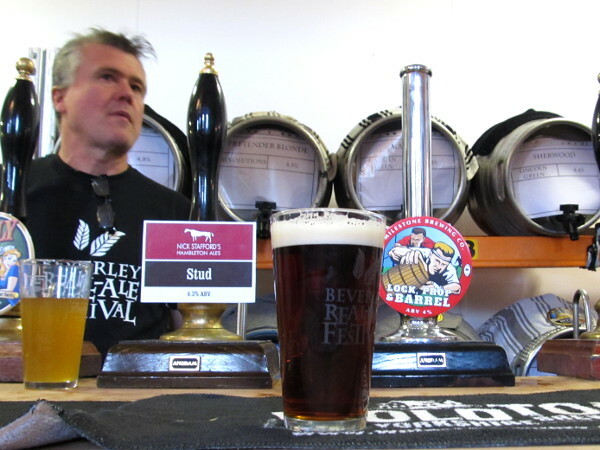 The festival opens with a Friday afternoon preview session where guests have first chance to sample world-class ales from local producers, including Great Newsome Brewery, Wold Top, Lillys Cider. Friday night is an all-ticket session with top local entertainment from some of the regions finest acts, supported by Off the Road. The festival’s family atmosphere continues throughout Saturday with more live music. This will include live music and great food and of course more beer!! You can get in free on on Saturday session with your glass from Friday night. *Once you are issued with your glass you must bring this back every time you visit. A charge of £2.50 is payable for replacement glasses. Tickets for the Friday night & Saturday night sessions gives you free entry on any afternoon session. You must bring your glass back to gain free entry. If you don’t have your glass an admission charge will be applied. However it is still on a first come first in basis.